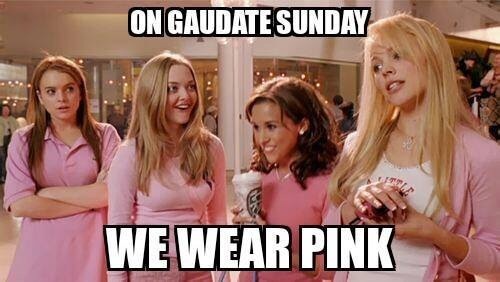 It’s the third Sunday of Advent – Gaudate Sunday – the day of the pink candle, the day of joy as Christ’s coming nears. Joy. Rejoice. At mass we hear 1 Thessalonians 5:16 “Brothers and sisters: Rejoice always.” in the second reading. To someone that has struggled with depression that is a tall order. Rejoice always, even when you can’t pay your bills. Rejoice always, even when your kids are noisy & messy & disobedient. Rejoice always, even when you have more work to do than hours in a day. As I sat at mass I asked myself: Do I follow St. Paul’s exhortation? I’m not so sure I do. Thankfully before I could think to myself “Great. Another thing I’m failing at” and get more depressed, the Holy Spirit encouraged me to seek after joy and stop being a sourpuss. The first thing He inspired me to do was to complain less (outwardly). Instead of venting to my mom or mother-in-law or whomever, I have been trying to bring my problems, concerns, questions, etc. to the Lord in prayer. I have been trying to rely upon Him and seek Him out as my source of comfort and strength. I have been trying to see God as my secret garden, place of rest & refuge and spring of refreshment. The next step, the Holy Spirit encouraged me to do was to come closer to the Lord through prayer. How could I learn from the Lord unless I listened to him. I tried to read the daily mass scriptures more often. I downloaded an app for that called Laudatewith the daily mass readings & reflections plus a lot more. I signed up for Fr Robert Baron’s advent meditationsAnd things were going better. But then the Pope said there’s no such thing as gloomy faced saints And I really want to be a saint. Therefore I’ve added something else to my routine. I’ve started trying to look around and find something I am grateful for. And I’ve started telling God how much I love him. It can be as simple as looking at the stars one night and appreciating them. Or during the Advent wreath having each person say one good thing that happened that day. Or thinking about it as I fall asleep at night. Either way, even amongst the craziness that is my life, the Lord is still blessing me and I need to notice & appreciate it. Which brings me to my last point. I need to look back on my life & see how God has been faithful and how He has blessed me. If He did it before, He can certainly do it again. I need to believe that and trust in that and I will be filled with joy. Because God has been so faithful to me. He has been so generous. One of the best ways to reflect on when God was with me is to re-read my prayer journals. I can read how I poured my heart out to God over a situation or circumstance and how in retrospect it didn’t seem like a big problem, like it did at the time. I love re-reading them and seeing the lessons that I’ve learned and the prayers that God has answered. This blog is like my new prayer journal. This way you can read it too and see what I’m learning about God and how He is teaching me and providing for me. This Gaudate week, my dear readers, I challenge you to adopt one of these practices. I’d love to hear about it! What are you thankful for? How do you cultivate joy?